I subscribed to the free course at roulettephysics.com which is pretty good, but a bit technical with parts I didn’t understand. The main part are a couple of videos in some of the issues. 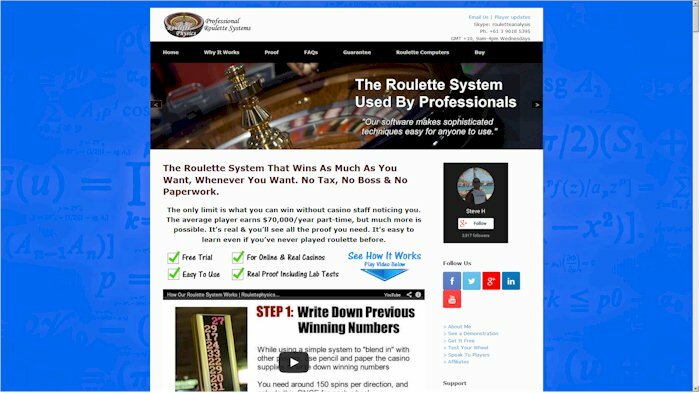 I found them very interesting and they did work on spins I found on youtube, but I dont believe it is very practical because you always have to bet late in the spin so I am giving it 2 stars. My review is only for the free course they have but not the full system. I dont have this part because its too expensive. Even if it worked as well as they say I still couldnt afford it. It really does work but you need time to use it. And patience. You cant use it everywhere though. I played in Launceston casino on rapid roulette and there was only one wheel ever open so alot of the time the conditions were bad and I had to wait. I at least made my money back but it took a long time. If you are considering this system, I reccomend it only if you have time and lots of wheels to choose from. I agree it really works but you cant compare physics systems like this with other systems. They are very different things. The owner, Steve, is very helpful in support but I think he has taken too many players because he can take 2 sometimes 3 days to respond. But when he does respond he answers everything. His support is otherwise very good. The player forum is excellent and has lots of extra software and videos that help alot. The community is helpful and cooperative. I’m not allowed to say much more about the system but can say it definitely does work but in my opinion it is not realistic you are going to quit your job and become a pro roulette player because you dont know if you will profit until you properly check the wheels you play at. You should start to learn carefully and play in spare time first. The rp website says you can beat about a third of wheels. I believe this is accurate but there is more to it because you never know when the casino is going to move the wheel. This has happened to me a few times which is probably the biggest thing casinos can do to stop you winning. This is a review of the roulettephysics website and the free systems on it. I do **not** have the paid for systems there or there roulette computers. I would if I could afford it. My review is of the website only and the free systems. I think the site is very professional with the information given. I am still testing the free systems and am very impressed with the results. I havent yet bet real money because I dont have a betting bankroll but will soon. Except to say in testing play it all seems to work. 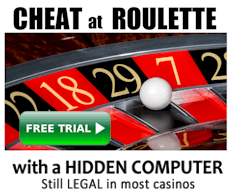 So far as Ive seen I think it is the best roulette site for professional casino players (roulette). This system works but you need about 300 spins for a wheel to make it work. I unfortunately dont have that kind of time so its not practical for me. I would give 4 stars for effectiveness because its not a scam but 1 star for practicality so am giving 2 1/2 stars total. Its very different to other systems I have used. You cant play on every table because sometimes the wheel doesnt meet the requirements. I found about 20% of wheels were ok, not the 35% roulettephysics site says. You put the spin information into the software online and get a bet chart. Then you have to watch the wheel for changes and use the bet chart that says where you need to be next. Again I’m not saying it doesnt work but it’s not for me. I’m afraid I wasted my money thinking I could dedicate more time to it. The system is only if you have enough time to do all the data collection. If you have a casino with lots of wheels it would be a lot easier but you would get banned too quickly if you kept winning anyway so you would need several casinos to swap between and make the most of it. I am a player of about 8 months. I was already very familiar with visual ballistic and similar approaches so I started with experience. This is not a system for newbies. If you expect to press a button and win you are dead wrong because newbies might find it a bit too much. I dont mean the software. I think the software is great and easy to use. I mean the data you need to collect and it may seem daunting for some people. There are also lots of odds and ends to learn like what to do if the casino does this or that. This is just the reality of any working method, you need data to analyze and need to know what you are doing. If you already know methods like visual ballistics then you will find the data collection part ok. Before I joined, steve said if I found visual ballistics easy enough, then I would find his system easy enough. This is a good example if your worried about it being too hard. The data collection is similar to ballistics but the play part is a lot easier with this system because you bet before the wheel spins. The system does work and I do very well with it. I personally find it fairly easy to use. Thats my opinion but I know some players find parts of the process too much, again more about the time it takes. Its not a fly by night quick system. I win about 8 of 10 sessions and spend around 2 hour sessions. Data collection can be take 1-2 days sometimes but is worth it. If you aren’t ok with that, then look elsewhere. I swap between 3 local casinos and sometimes online casinos. 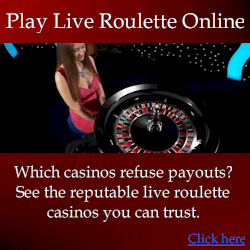 But online I had an account restricted from live games once so not every online casino is ok. Especially the online casinos are too aware now so it is getting harder to win online. Steves support is exceptional. He spends the time and has an incredible knowledge of the game. I love the tools he provides which make life much easier. My advice is if you dont mind spending time and some hard work, it can pay off very well. Its a serious system for professionals. If you are lazy or after something quick and easy, stay out of the casino because no professional system is right for you. Be realistic about how dedicated you will be before joining. If you expect success on a silver plate, you are going to be disappointed. If you can put in the time and dont expect there wont be nothing you have to learn, you can do well. This is as good as it gets. Helpful review, thanks. I believe it works but the price tag is hefty and my main concern is I will find it too complicated. The general consensus is it works but there are different opinions on how difficult it is.